One essential goal of the project is to take into account the multi-scale problem of galaxy formation: we will deal with a volume corresponding to our "Horizon", i.e. a sphere of radius 13.7 billion of light-years, or 4.27 Gpc. Within this volume, we would like to zoom in towards some large-scale structures that are observed today in giant sky surveys, like super-clusters, and clusters of galaxies, that form at the crossing of cosmic filaments. Within these galaxy clusters, it is imperative to follow from the beginning the formation of galaxy-scale structures, fueled by matter inflowing within cosmic filaments. 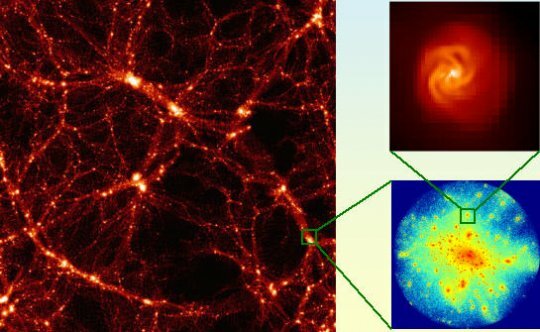 Galaxy-scale simulations (20kpc scale, with 20pc resolution) will be carried out taking into account the boundary conditions provided by the large-scale simulations, by means of several levels zoom-in simulations. The following picture illustrates the multi-scale character of the foreseen simulations.